So I was trying to find a nice bright theme for my desktop or for my Gmail when I came across this beauty. 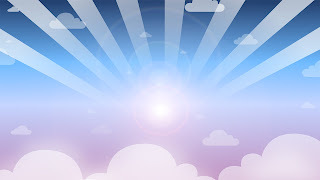 Somehow this basic wallpaper with blue sky, white clouds and sun rays seemed to calm my mind. So, if you feel like changing our desktop wallpaper into something soothing, this is probably a great option for you! 'The World Ends With You' sequel? Yes please!